Evie gained her PPL in 1989 at the age of 68, went on to obtain night, instrument and multi-engine ratings, and held both UK and US licences. When well over the age of seventy she entered and won a number of flying competitions and in 1992 was presented with the Jean Lennox Bird Trophy for the Most Outstanding British Woman Pilot of the Year. 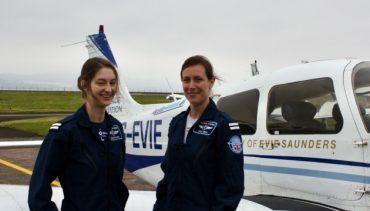 In 2003 Evie became ill and decided to purchase an aircraft to be used for teaching young people to fly, confiding this only to her niece, Lorraine Richardson. 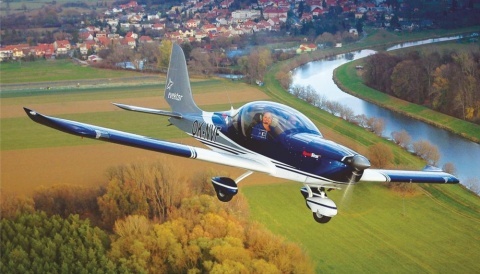 But sadly Evie died before she had a chance to fly Piper Warrior G-EVIE. Lorraine then set out to ensure that Evie’s dream became a reality. 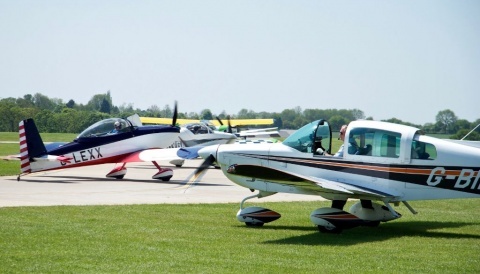 Noting that, at present, only 12% of UK pilots are female, with the worldwide figure even lower at just 6%, Rachel and Claire will fly G-EVIE on ‘Evie’s Grand Tour of Britain’. Twenty-three-year-old Rachel, a University of St Andrews graduate, began her PPL training at Prestwick aged sixteen, flew solo later that year and gained her PPL at eighteen. One of fifteen women currently enrolled on the BSc Professional Pilot Aviation Practice course at Tayside Aviation, Rachel says: “For most school-leavers, and women generally, becoming a pilot isn’t necessarily an obvious career choice. Claire (35), who began flying at the age of fourteen after getting a gift voucher lesson from her father, is a former RAF navigator who spent ten years in the back seat of a Tornado, including a detachment in the Falkland Islands. She then gained het PPL at Dundee, and has also gained her New Zealand PPL. Now Safety Officer at Tayside, Claire is working towards for her CPL. Evie’s niece Lorraine says: “It is really exciting and emotional for me to think that these ladies are embarking on this trip and that Evie’s dream is still making such a difference. “My aunt would have been so thrilled and excited about the tour and full of praise for Rachel, Claire and Tayside Aviation, especially (Tayside’s Managing Director) James Watt for organising it. Subject to change, Rachel and Claire will route Dundee-Durham-Syerston-Norwich-White Waltham-Compton Abbas-Bournemouth-Dunkeswell-Land’s End-Swansea-Caernarfon-Kirkbride-Newtownards-Prestwick-Oban-Inverness-Kirkwall-Dundee. Their progress can be followed here and on Facebook, Instagram and Twitter.